So pretty! That butterfly is gorgeous! Thank you for playing along with my Flutter By Wednesday Challenge! What a beautiful card Natalyia, beautiful spring colours and gorgeous butterfly. Thanks for joining in with us at Flutter By Wednesday..
Beautiful creation.. Love the beautiful butterfly & perfect coloring. Thanks for joining us at TPS, good luck with the challenge. Thanks for playing with the Divas this week, so glad you joined us, and good luck!!! 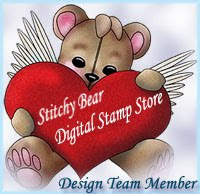 Sweet Pea Stamps Blog Hop!!!!! !